The Clouds Above is a fantasy graphic novel for children. It is vigorously drawn and colored, with one drawing per page. 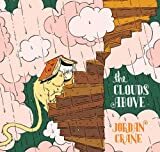 A little boy Simon and his big cat Jack get diverted on their trip to school and end up climbing a rickety staircase that goes all the way to the clouds. They meet a giant cloud creature called Perch and he takes them on a ride, where they end up at school again, getting the better of their cruel teacher. Jack is a reluctant partner in this adventure since he does not like getting wet, but little Jack has gumption enough for the both of them. It has a fair amount of charm, even if the story is not particularly memorable and we never learn much about Simon and his cat. Perch is a strange figure because he is so sad, missing the company of birds. The cloud cries continually, raining onto the ground below. Perch eventually becomes happy again through his death, when he eventually becomes a puddle and is reunited with bathing birds. So the book has a poignant sensibility mixed in with the antics of the escapade. The final emotion of the book is one of revenge through humiliation, with the teacher hiding under her desk, thinking her classroom is full of birds, while the children make squawking noises. This may leave some parents disturbed, but child readers will probably love it.